No matter the occasion — Birthday Celebration, Girls night out, Bachelorette party, Bridal shower, Baby shower, Corporate events, Employee appreciation, Team Building, Fundraisers or just a great night out with friends — this is a party no one will forget! Relax and leave all the work to us! We offer Canvas painting, wine glass painting and Tote painting party options. To book your private event we require a minimum of 10 people. We can accommodate maximum 70 people at our studio. Bring your favorite snacks and beverages. We supply all painting supplies, wine glasses, corkscrews and aprons. Step by step instruction provided by a professional artist. We have well decorated Party hall room with tables for food and drink, DJ style music with disco lighting for dancing. You can bring your own music, iPods, and CDs. We will hook it up in our BOOMING sound system with Disco lighting. Please call us for rates and other information. Thanks for considering Paint Fun Studio for your private event. 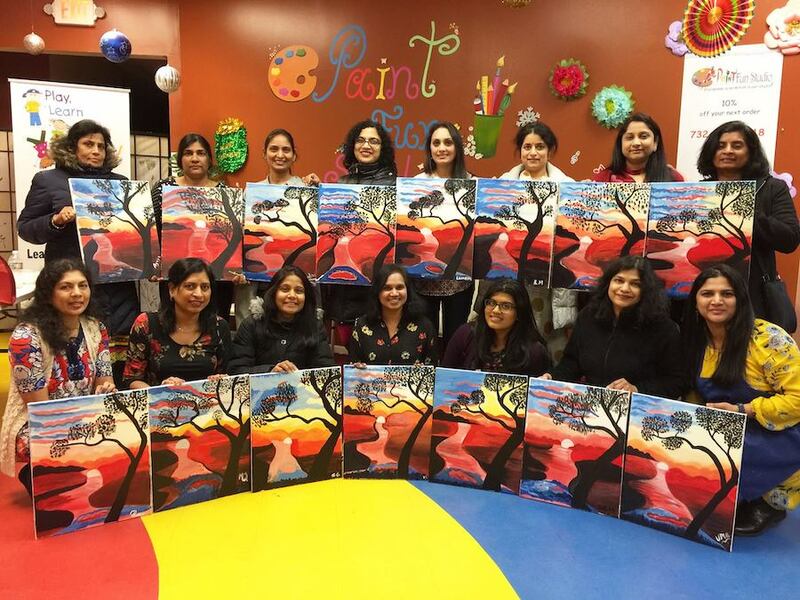 Our painting parties are always memorable; great for birthdays, showers, bachelorette’s, Girls Night Out, corporate gatherings and team-building events, or simply a fun night out! Please read below to learn about our competitive price around the area. We can say in confidence and pride, that no other studio can beat our price! Deposit of $150 is required to secure the desired date and time, after availability is confirmed by the studio. Please note that private parties book quickly, especially on the weekends, so please try and schedule as far in advance as possible. It is $25 per person, minimum of 12 people. Total payment(minus $150) is due at the beginning of the party, with cash only. If paid by check, send the check to us minimum 5 days ahead of time. If pay by credit or debit card, there will be 3% extra charge. There is minimum of 15% service Fee which includes tax and service fees, will be due with final payment, no exception. You are responsible to set up and clean up the party room. We will provide you numbers of tables in the party room per your request. You are responsible to bring the table clothes, food, drinks, utensils, cups, plates paper napkins and any other things you need for your party. PFS is responsible for the studio and all the supplies needed for the painting. 3 Hours of celebration! Doors will open 25 minutes in advance of the official start time. All parties begin promptly at the scheduled time. For that reason, please have your guests arrive at least 15 minutes prior to the scheduled time. An additional studio fee of $75 will be added to your cost if your group exceeds the 30- minute grace period at the end of the party. We will be happy to accommodate any other requests should you need additional time for opening gifts, visiting, etc. at $75 per hour. Your choice of any painting on canvas. Decorated Party hall room with tables for food and drink, Apron, all the paint supplies DJ style music with disco lighting for dancing. You can bring your own music, iPods, and CDs. We will hook it up in our BOOMING sound system with Disco lighting. Food/Beverages: We encourage you to bring any drinks, food, and/or snacks that you’d like. Despite the best of intentions and the most organized of plans, we understand that unforeseen events could possibly challenge the ability of you (or your guests) to make it to your private party. Please let us know as soon as you know! Deposits are subject to forfeiture only when PFS is NOT notified at least 2 weeks in advance of the event's scheduled start time. You may opt to reschedule your Private Party with at least 2 weeks advance notice at no charge. If the event is cancelled after that time, your deposit will be forfeited – no exceptions! Please submit the party request form below. A deposit of $150 is required to reserve a time slot and artist. The deposit will be applied against your final balance. Once confirmed, we will send you our picture selection file. A customized painting option is available for an additional $30. Our doors will open 25 minutes prior to your event. Please call us or email us your preferred date, time and your phone number . We will contact you within 24 hours.